Razer released a full page Wall Street Journal ad telling us all the obvious. PC Gaming is not dead. Thanks. Mojang and I agree with you Razer. They made that claim as a teaser for the release of the Blade. A very thin, very portable gaming laptop. They must not have done much market research as they touted it as “the world’s first true gaming laptop.” Or perhaps they just don’t feel that Alienware machines are up to par. Either way what’s remarkable beyond the terrible advertising, is the “Switchblade User Interface”. That little extra set of buttons and touch pad in the lower right corner of the Laptop. Almost like a mouse, but not quite. This is an innovative product, perhaps even a ‘disruptive’ one. You can tell by the number of comments on various sites like Ars Technica (Great article Ben! ), The Escapist Magazine, and Reddit that the community is divided. ‘Passionate discourse’ is a sure sign of disruption. That is exactly what a company wants in a product launch. The company wants half the people to love it (and buy it) and the other half to hate it (but not stop talking about it). It is a ‘good sign’ for the company that there are so many people making a fuss about this laptop. However there are some things going on here which are amiss. They have missed the market(ing) for this device by a lot. Their WSJ add suggests a sort of ubiquitous gaming device that will ‘reinvigorate pc gaming’, but asking a very high price tag for it in a very bad economy. Any reasonable PC gamer with $2800 in their pocket is going to build a liquid cooled device with 6x 3.2 gig cores. Their brand narrative and their price point are at odds with each other. Learn from this my fellow business gamers. These devices should have been put in the hands of a really competent WoW/FPS coder, and let them come up with a really swanky mod before release. Or perhaps sold to pro or semi pro game players. To stay at the present price point, their marketing should have targeted the ‘prestige class’ of gamers. They needed to do this because they need ‘early adopters’ who are capable of purchasing an expensive product. All in all this could eventually be a big win for Razer, but in the near term the Blade will be a big flop. Razer has not respected “The Chasm“. They are trying to market disruptive (expensive) technology to every gamer. They should have sold it to the innovators first. This would allow some sales at this higher price point. Some sales, plus time would allow for refined manufacturing that lowers the cost of the I/O device before targeting the majority of gamers. Instead they attempted to make a huge splash with the general gaming audience (and all readers of the Wall Street Journal). New tech is always expensive. But technology always lowers in price over time. This new input device is incredibly expensive, right now. For $2800 you get an under powered laptop… Using Alienware/Dell‘s website you can build a comparable machine for $1,649. That means that Razer is currently asking approximately $1151 for just the Switchblade UI. That is a huge percentage of the cost of the machine for a user interface that may not have any additional software functionality yet. Then again the general PC Gamers may not be the target audience. Perhaps large corporations are the target audience. Lets assume for a minute that they actually know about “The Chasm”. 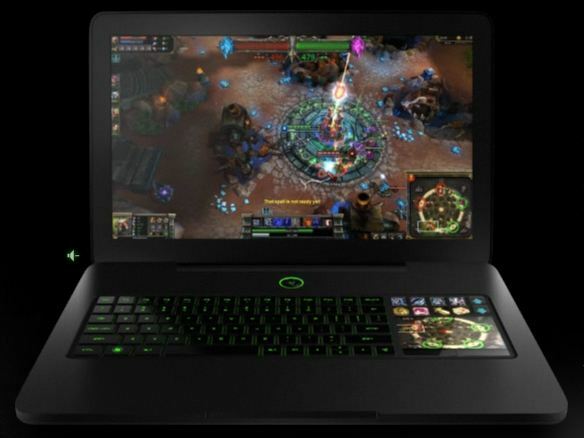 Picking the WSJ to announce to the world that Razer is an innovative and disruptive company in a huge industry (I attempted to look for laptop sales figures, but was unable to find anything relevant, any help finding that data would be appreciated). Maybe they are playing a different game then we think they are. They could be really tricky, or really dumb. I like the statements made by the CEO and Creative Director of Razer, Min-Liang Tan. They purchased their own Taiwanese company to produce the device. They use no focus groups in the design, they rely solely on making a device that they themselves want to game with. (All that quoted from ArsTechnica article previously linked, again thank you Ben.) Far from being a negative, in my mind this means they are directly in touch with the community. That means that when feedback hits them (and it will hit them hard), it wont be filtered through a third party. These are exactly the kind of things that disruptive companies do, and exactly the kind of thing that they need to do. While PC gaming was never truly dead, I hope this is a rebirth of Razer’s innovation. They just need to understand the difference between manufacturing technology and creating innovative technology. Razer does not get the difference yet. Haha! Lysdexics of the world untie! And then correct your mistakes. I'm glad somebody pointed that out! Thank you. which really IS target-marketed to the early adopters. Razr is already positioned as a high-mid-tier gaming supplies. I think Blade will continue to move lackluster sales numbers. Even Art Lebedev I think will only ever be a disruptor just the once. It's a hard thing to be. @Falkreon: Exactly. Razer (Razr is a phone made by Motorola) is using press and making statements as though they were an disruptive technology, but then they don't back it up with actual disruptive technology. Their marketing is not in line with their technology. Additionally they don't do simple things to support the product that would help it actually catch on. They are trying to jump right into the 'mainstream' without understanding or respecting the place of early adopters. They are trying to duplicate Apple without understanding Apple.